1965 and five teenage band members runaway to London to pursue their dream of making it big in the music industry. The trip starts to go wrong not long after leaving Glasgow and by the time they’re in London their skint, wanted by the law, and have Rachel, the lead singer’s cousin, in tow. By chance they end up in the company of a socialite doctor and his circle of celebrity friends, but their friendship is coming under strain and their dreams lie in tatters. 2015 and Maurie is dying of cancer, Jack is a widower, and Dave is an alcoholic whose wife has left him. All three have led lives of regret and under-achievement, their runaway adventure still being the highlight of their lives; all three still dream of how life could have turned out differently, especially for the band member who didn’t return home. When Maurie spots a newspaper story detailing the death of a former actor, who’s been on the run since they last saw him, he’s determined to head back to London before he dies to resolve unfinished business, accompanied by his old friends. 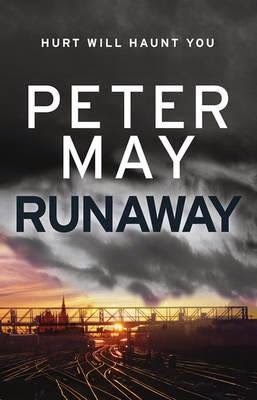 In Runaway Peter May juxtaposes a coming of age tale set in 1965, and its hope, faith, growing pains and hard lessons, with an end of life tale set in 2015, and its regrets, disappointments, and nostalgia. What links the two together is a singular event - running away to London from Glasgow - that is both the highest and lowest point of the main character’s life and still casts a powerful shadow over him. The tale is told from the perspective of Jack Mackay, split into a present day narrative told in the third person, and a historical narrative told in the first person. This works well, allowing the two time periods to inform and mirror each other, as Jack and two his band mates retrace their steps fifty years later. The strength of the story are the principal characters and their interactions. The plot is relatively straightforward, telling in parallel the two road-trip adventures to London, and is notable more for its exposition of friendship, life’s journeys and nostalgia, than its crime or mystery elements. Indeed, the tension in the story is generated more through rifts in the group and between family members than by sinister elements in the plot. The overall effect is a story that is interesting and entertaining, but which never really turned into a page-turner due to its predictable outcome and pacing. I think any book that uses nostalgia can come across as self-indulgent. I think the main issue with the story was that the nostalgia wasn't sufficiently balance with the mystery element. Otherwise, it worked okay.